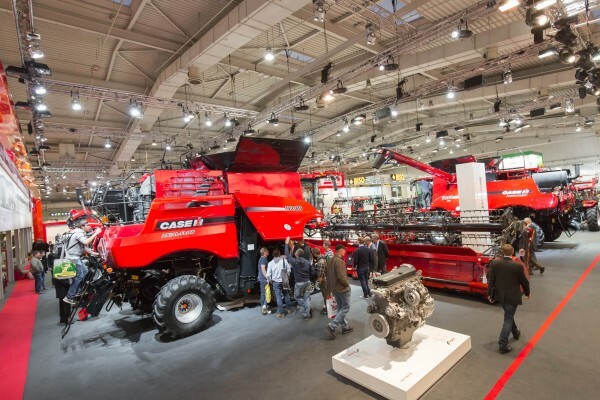 Technical agricultural trends and standards are often built on Case IH innovations. This applies to the Original – the Case IH Quadtrac – which not only defines the standard in terms of traction and soil conservation, but now also features an additional 'Efficiency boost'. The same applies to the Axial Flow® – The 140 series with the new Cross Flow cleaning system and optional tracked drives on the front axle on the top two models. “As the world's largest trade fair for innovative agricultural technology, Agritechnica is a particularly important event for us. Again in 2015, we have presented not only eye-catching new developments but also key developments and innovations on tried and tested models. This year, in addition to the Quadtrac and the Magnum Rowtrac, our 140 and 240 series also feature optional tracked drives: a clear indication that Case IH is forging ahead as 'Leader of the Track' in the key area of soil conservation", says Andreas Klauser, Brand President Case IH. With its four independent tracked drives, the Case IH Quadtrac has been setting a growing trend since the first prototype hit the market in 1992 and is now an integral part of strategies for improving traction and reducing compaction. 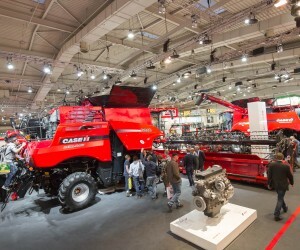 Case IH is the 'Master of the Track!' now 'The Original' features additional improvements. With increased transmission efficiency rating of between 2 and 5% and approximately 40% faster shuttle compared to the 2015 model year, the Quadtrac has made a 'flying start' into the new model year. This has also been made possible by features including new steering, enabling fewer rotations until full lock in the field, the new automatic differential lock for the front and rear axles and comprehensive new lighting options, enabling safe, efficient and precise work even when it's dark. Near zero grain losses – a feature of the new Axial Flow 140 series, with further improvements to power, user-friendliness and reliability. The Cross Flow slope compensation feature automatically compensates for up to 12° inclines, without driver input. For maximum efficiency, the system is only activated when it is really needed. Numerous customer requests have been integrated into the 2016 model year. As an example it now offers the ease of adaption from swathing to straw chopping leading to improved work results. A particular highlight is the availability of the 'F-type rubber track drive from Zuidberg Tracks®, a rubber track drive manufacturer based in the Netherlands. The rubber tracks were developed for Case IH for the 140 models with a new final drive. This way, Case IH is reinforcing its commitment to providing further improvements and direction to soil conservation solutions. 240 series models also turn heads with improved productivity and efficiency. Changes to the straw spreader ensure improved distribution of residue over larger cutting widths. This can be monitored and changed from the comfort of the cab to adapt for varying wind and crop conditions. Further updates to the 2016 model year allow the standard unloading system to be equipped with the pivoting unloading spout for precise unloading into the grain trailer. For consistently high productivity levels, the Case IH LB 424 and LB 434 rotor cutter large square now influence the tractor's speed via the latest ISOBUS software. This means the 'Filling control' can be optimised, i.e. the time required to fill the pre-bale chamber. The “slice” control can simultaneously optimise bale density, i.e. a constant number of layers can be entered for a preselected bale length. This enables higher outputs and potential fuel savings. In models without rotor cutters, only layer thickness control can be optimised. The innovations on show at Agritechnica include the AFS Pro 700 monitor which, in conjunction with the new ElectriSteer universal steering motor, which can also be retrofitted to earlier models. The monitor now also permits data to be displayed in ISO XML format; data exchange is also facilitated as a result, now making Shape File Format editing possible, through which information on field boundaries, guidance lines and variable rate application maps for fertilising and spraying is frequently provided from external partners. Another small, yet practical detail is also that the work screens, instead of displaying 'Run 1 to Run 6' can now be customised and individual names including 'GPS', 'ISOBUS' or other names can be entered.